It seems that revolutions always come in pairs, or that is at least the case in Yemen, probably the most underreported country from the movement collectively known as Arab Spring. Near the end of last year, after 10 months of tireless protests erupting on an almost daily basis all over the country, demanding the resignation of decades-long president Ali Abdullah Saleh and significant improvement in the living conditions of the poorest Arab country, an attempt at mediation was brokered by the Gulf Cooperation Council in order to end the long political crisis that left hundreds and thousands of casualties at the hand of government forces. Even through the deal was signed under the auspice of the United States, this has done very little to end the year-long crisis and stability has been very slow to return. The deal would not only be translated into a political transition but was also meant to grant immunity to Saleh and all of those associated with him. The main argument of the immunity in the eyes of both the brokers and opposition politicians in Yemen is to prevent a slide into a civil war in a country already impoverished, faced with tribalism, regionalism, high illiteracy rates and widespread corruption. Yemenis on the other hand, were not very happy about the deal and although many opposition politicians supported it and committed themselves to abide by it, the revolutionary youths and activists were clearly opposed to it and demanded Saleh and his family and officers to be put to trial for crimes against the Yemeni people, including not only murder and countless human rights abuses in the course of the uprising but also those committed in the decades-long authoritarian rule. Already in December protests erupted again against the immunity clause and on December 20, thousands of Yemenis joined the “Life March” from the city of Taiz to the capital Sana’a to stage a demonstration in front of parliament on Saturday, December 24, to protest immunity being granted to Saleh. The march was one of the longest marches by foot recorded and in the course of which, demonstrators were also attacked and armed thugs prevented food and blanket from reaching the protesters even though they had been walking for days all the way to Sana’a. On that same month, a new wave of protests started all over again to fight corruption that in the words of a Yemeni newspaper, “has invaded every institution in Yemen and fighting it should come at the top of the agenda of the new government if they really want to terminate the suffering of the people in Yemen”. The revolution moved from squares to institutions after the political opposition failed to address the grievances of the Yemeni street and no steps were taken to oust corrupt officials. Protests were staged then in front of government offices, colleges, universities and many other public institutions. It seems as if the people are determined not to stop protesting until their demands are met, in what has been termed the new revolution against corruption. Last week another revolution inside a revolution was begun when a Yemeni activist began a campaign via social media called “I want Yemen to change – I will not store qat”, whose target was to raise awareness about the dangers associated with qat consumption. The controversial plant and social drug, now banned in most in many Western countries, is consumed by a majority of the population and takes a very sizeable portion of the country’s water, land and income from already impoverished families, many of which subsist on a diet of nothing but bread and tea. The culture of qat in Yemen is already a distinguishable feature of Yemeni society and today is considered by many the building block of the Yemeni identity, in spite of the fact that looking back in time, qat consumption has increased rather than decreased with the urbanization and modernization of the country, promoted by state policies out of which only very few profited. The event ran yesterday and relied on the support of Nobel laureate Tawakkol Karman and of leading Palestinian intellectual Azmi Bashara. It received selective media attention after activists campaigned for it and several Yemeni designers and graphic artists submitted art work and posters for the campaign. Support was not unanimous and many in Yemen complained about how a campaign of this kind would leave many Yemeni families without their daily income and groups appeared on social media promoting support for qat and one of them, even offering substantial discounts to qat buyers in the course of the day. The event ran in Sana’a and Taiz and even though the attendance was not massive, the reaction to the event was very positive and it succeeded in raising awareness about this problem, with deep economic and social repercussions. Because of the reliance on qat by so many farmers in the country, it is impossible to ban qat but this campaign might be seen as a first step in yet another revolution that is not only political but also social, cultural and critical of policy-making overall. Only a day after the controversial event against, qat, in the southern Yemeni city of Aden, a rally is being held to promote reconciliation and forgiveness among Yemenis. Unity in Yemen has proven very difficult between the restive north, the capital Sana’a, the once cosmopolitan south and other parts of the country, such as the Tihama – bordering with Africa – that has been neglected by the government for decades. The threat of secession between different parts of the country is always present and it is difficult to address all the issues at the same time. It is also necessary to mention here that the southern governorate of Abyan was declared in March an Islamic Emirate by Islamist groups, after government forces lost control of the region to Islamist militants and the region might be the most serious humanitarian crisis in Yemen, of which there is next to no information or reports available. 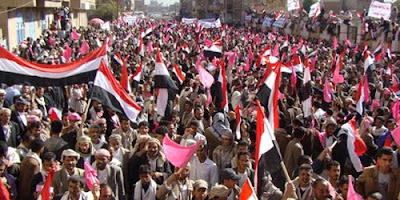 What remains clear is that the revolution in Yemen is not one but many revolutions and that the people will continue exercising their new-found power – protesting, for which they have demonstrated creative abilities and an infinite supply of patience: In Yemen, protests are not only political acts of defiance but also public spaces in which art, music, poetry and political discussions are present. It is unlikely that under present circumstances and without expurgating the unprecedented levels of corruption at all institutional levels, the grievances that led to the Yemeni revolution might be solved anytime soon or simply with elections, the results of which are compromised in advance. Yemenis in general are certainly not ready to accept immunity for the ousted president as the foundation of a political system, since justice and reconciliation are key elements in the configuration of democratic politics. The fact that Yemen is a country with more firearms than citizens and that the demonstrations remained peaceful in the course of an entire year, gives an indication that the revolution is peaceful and that the threat of a civil war is now perhaps exaggerated. In the meantime many revolutions continue running in parallel, social, cultural, political and religious; the number of issues to be dealt with and that require campaigns and revolutions are next to endless but there is little doubt that the revolution is far from over and in fact, it might be only beginning now.